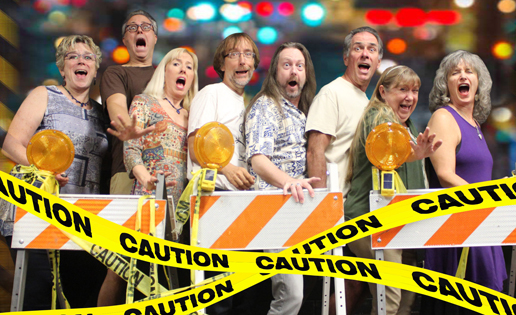 After a long summer hiatus, Sedona’s favorite improv comedy troupe is back with all new lineup so funny it comes with a warning label “Caution: Comedy Ahead.” From politics to religion to the Home Rule vote in November, it’s all up for comedic examination. Zenprov performs on Saturday, September 29 at 7:30 pm at the Mary Fisher Theater in Sedona. Tickets are $12 advanced purchase, or $15 the day of the show. If you’ve never attended one of their live performances before, Zenprov Comedy is similar to the popular improvised TV show “Whose Line Is It Anyway?” The troupe performs fast-paced games and scenes created in the moment—always based on audience suggestions. Unlike sketch or standup comedy, nothing is rehearsed or scripted ahead of time. Best of all, it’s never the same show twice. Over the summer, Zenprov hired a professional improv coach from Second City in Los Angeles to elevate the troupe’s play to the next level of authenticity and hilarity. Moving forward, the troupe will add more Chicago-style, long-form sets to their shows. In that vein, Zenprov Comedy will use a post from either the Sedona Bulletin Board on Facebook or a Red Rock News article selected at random as inspiration to launch into fun and engaging characters created in the moment. The Zenprov Comedy players embrace the Del Close method of improv acting, which emphasizes the “group mind” that mysteriously develops during a performance. Miraculously, the player’s minds fuse together to create a “super mind” where they practically finish each other’s sentences—and often do. Laughter ensues. The super minds of Zenprov Comedy are Derek Dujardin, Shaeri Richards, Chris Redish, Tom Shoemaker, Shaunn Cochran, Betty Testa, Linda Roemer and Mary Carder.?? Tickets are $12 pre-sale and $15 the day of the show. Shows are rated PG-13 and run approximately 90 minutes. Visit www.ZenprovComedy.com to learn more.